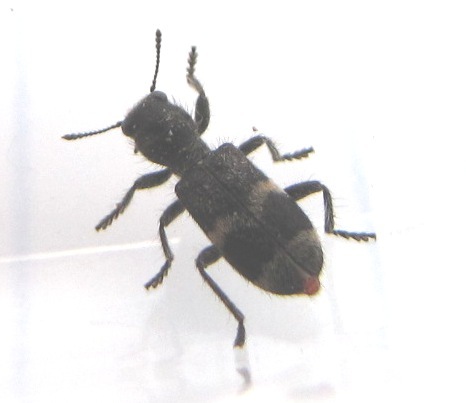 I found a little checkered beetle in my kitchen. It was traipsing across the edge of a clean plate that was drying next to the sink. I took a picture of it sitting in a pill container. The flash went off; it curled into a little ball and twitched. I think I killed it. Oh, wait, no, it’s ok now. I really wish I knew something about lenses and proper lighting and stuff, although once I fiddled with the brightness/colour a bit the image turned out not terrible. The little guy is approximately 4-5mm in length. Clubbed antennae, hairs covering the entire body, pretty yellowish pattern on the elytra. If I had to take a stab at it, based on my new favourite link for all things Enoclerus-ish, I think it’s a Enoclerus nigripes rufiventris (Coleoptera: Cleridae). I don’t know if it’s because we live in the country or because we often are guilty of leaving the lights on, but our house seems to have a Welcome mat on the door for random, out-of-season insects. It’s pretty fun, especially during the long, dark, winter months. I’ll keep introducing y’all to my new houseguests as they make themselves known to me. Enoclerus nigripes rufiventris looks good to me. Clerids are yet another of the many groups that distract me from focused study! Is that because they’re so bee-yoo-tee-ful?? ?